Sadly, Catherine loves baking and wishes to open a shop to share her pastries and confections with the Kingdom. Something a queen surely cannot do. Meeting the court’s new jester makes accepting the proposal even more impossible, for he finds a special place in her heart. Especially when she thinks the king to be a spineless and somewhat pathetic man. Catherine wants to define her own destiny, decide who she falls in love with despite invoking her parents rage. Yet, in this land of magic and mystery, fate has other plans. 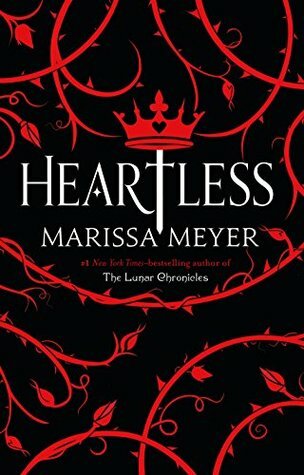 Heartless starts off rather slowly, though the descriptions of sea salted caramels, rosewater macarons and and lemon tarts were enough for my watering mouth to keep me occupied. Slowly, we are introduced to the Kingdom of Hearts with all its delightful, familiar characters. I admire Marissa Meyer’s ability to write as if her story has always been a part of Wonderland. Her writing paints colorful and whimsical scenes in my mind. She takes inspiration from the original and weaves on so naturally. A great example of this case is the Hatter. We all know him as the Mad Hatter of course, but was he ever not mad? In Marissa Meyer’s adaptation, he is in fact afraid to become mad. He was a very enjoyable character to get to know in such a way. There’s a scene in which he hosts a tea party (doh!) and I think it was one of my favorite scenes! And there’s of course the Cheshire Cat. Impossible not to become a favorite. Alice in Wonderland is not the only thing Heartless refers to, however. There’s a sub-character called the Raven, which was an obvious reference to Edgar Allan Poe’s most famous work. He spoke in rhyme entirely, dropping a famous quote every now and then. I couldn’t help but grin a little. Heartless doesn’t stay sweet and lovely from beginning to end, however. Catherine undergoes an important change we all know is coming. It all has to do with Jest and her will to choose who she’ll loves. They are both enjoyable characters, though I was never truly invested in their romance. This while I’m secretly a romance junkie! I didn’t feel like Catherine was fighting very hard for their relationship. Even though she was claiming to reject the king constantly. The change in her character felt very abrupt, and not as well done as I had hoped. Marissa Meyer has written a story of a fairy tale queen gone bitter before. It’s a short story in her famous Lunar Chronicles series called Fairest. I adored that one, felt sympathy for the main character even though I never agreed with her. I never felt this way with Catherine. Fairest was severely creepy and twisted, and I was expecting Heartless to have more of that, too. It was an enjoyable read, but I wish I was more invested in the change of the main characters. Marissa’s retelling is full of wonderful references. She lets the original Alice in Wonderland inspire her, instead of outright copying it. She even included an answer to Lewis Carroll’s famous unanswered riddle..
Really? You don’t see any images at all?